• Repeat sits on the left side (heel side) to turn running and suddenly stopping and sitting into a game. 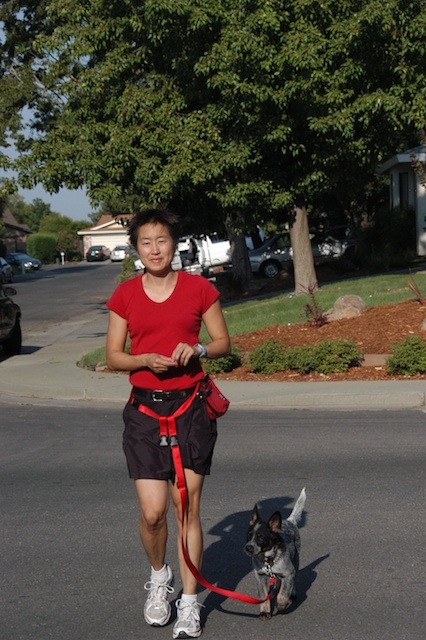 • Proper speed to walk to help your dog understand where you want him to go as well as how to turn properly in about-turns and U-turns so that you can clearly direct Fido to lead, as in a partners’ dance. • How to reward for attention while you’re heeling. 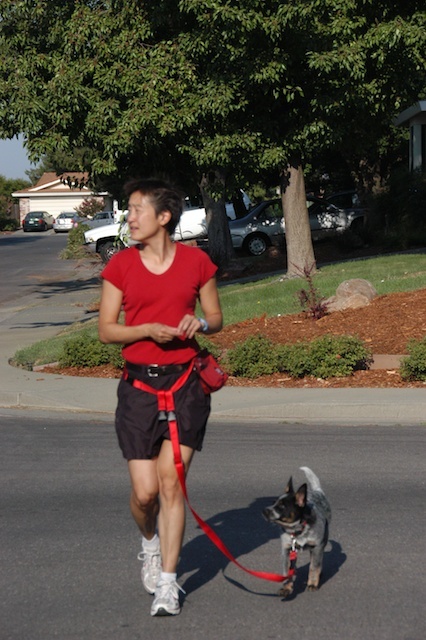 • How to get your dog into heel ﻿position so﻿ that he can walk beside you. So which techniques should you focus on for your dog? It depends. Does he like to sprint ahead or is happy to lag behind or meander at your side? Or is he so nervous of the environment that he won’t take treats? Here are three starting points and the progression into a walk. 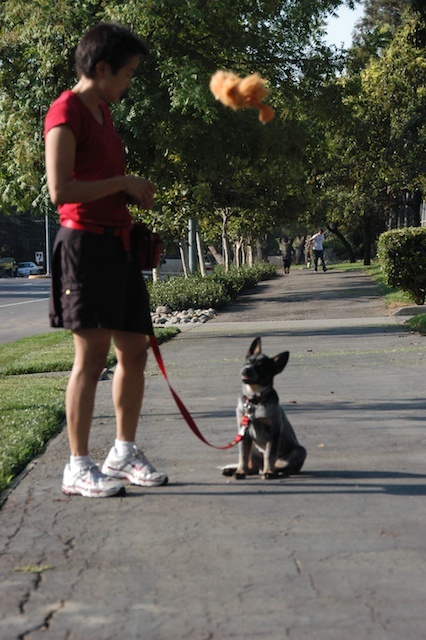 Start with repeat sits on left side with luring--best for puppies and dogs who are just learning and are a little tentative or move at a slower pace. We can start the first walks with repeat sits on the left side with luring. For instance, here’s Lucy, my dad’s 8-week old puppy on one of her first walks. She already knew repeat sit backwards and to race after me and sit when she caught up (WatchPuppy's First Day Home). So this walking is just an extension of these exercises. The lure is important because without it she starts heading to the wrong side. Here she is again at 12 weeks of age when my parents let me take her to work with me. I start with regular luring and then as she gets the idea it becomes more of a flash lure. You should be able to get past the luring stage in just a couple of walks if you are walking fast enough to provide clear direction and your timing on when to lure is correct. Graduate to or start with repeat sits on the left side with a flash lure for dogs who like to sprint ahead or who have graduated past the basic lure. 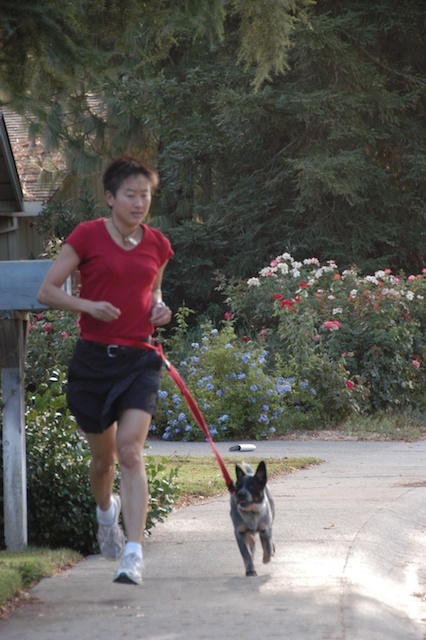 For dogs who like to sprint ahead or drag you in different directions, repeat sits on the left side can really come in handy. The trick here is that you must move fast enough to make it fun and then stop suddenly but block Fido with the treat fast enough so he stops instead of sprinting by. Pretty soon this rapid start-stop becomes a fun game. As soon as it does, you can fade the flash lure out and you can also start rewarding Fido while he’s heeling next to you instead of always having to wait for him to sit. So how do you put these exercises together to go for a walk? Here’s an example with my dad’s dog, Lucy, when I got to work with her at 12 weeks. 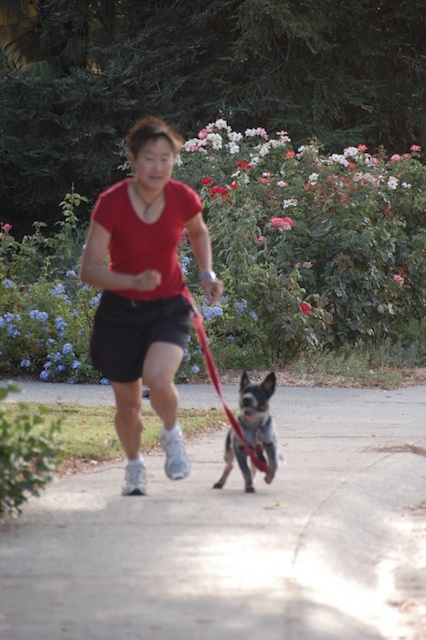 Your walks should focus on keeping your dog at your side and on loose leash at all times, except when you decide to move closer to bushes or shrubs so that Fido can stop and sniff (on a loose leash). 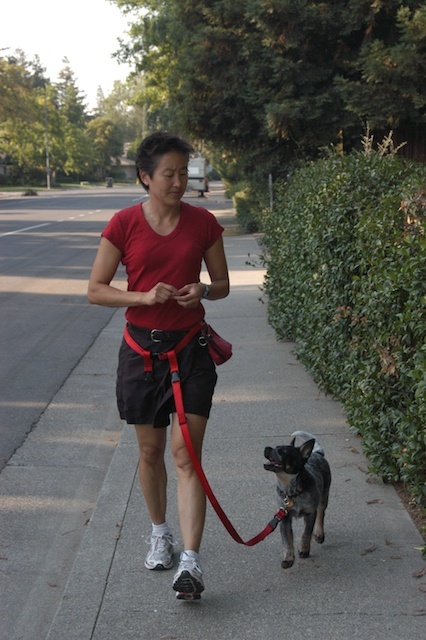 This means that at first your walks may need to be pretty short—short enough so that you can concentrate on the technique and so that Fido won’t get full or run out of treats (a.k.a his meal). The best way to do this is just go on a short walk for time rather than distance. 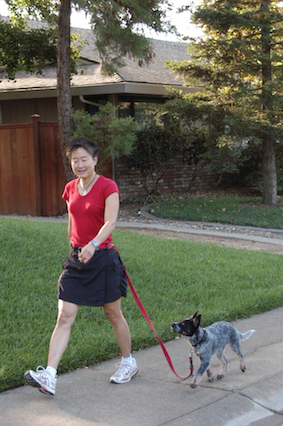 My first two walks with Lucy when she was 12 weeks of age were pretty short—5-10 minutes and just 1-2 blocks. I had to stop every 5-10 steps and reward her for sitting. If I went longer than that she tended to cross over and would try to walk on the right side or she’d rush ahead. I’d reward her with both treats and petting for 5 seconds as seen in the photo below. I also made sure I had a curb or fence along which to practice the repeat sits at first. In this next set of photos, Lucy’s not looking up at me while she’s walking. She doesn't have to watch me at all times on the walk; she just needs to be by my side or a little behind. 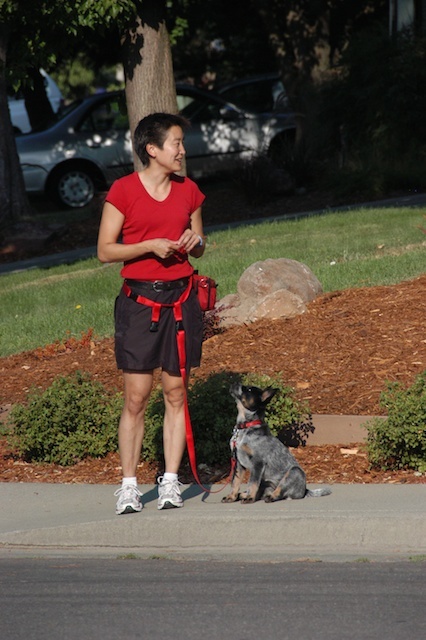 However, I do want to be able to get her to focus while heeling next to me for at least 30-60 seconds at a time during high distractions so that I can prevent her from barking, lunging, or pulling towards distractions such as dogs, kids, bicyclers and cars going by. Note that many dogs won’t stay next to you at first, especially with distractions, unless you keep them 100% focused on you during walks. 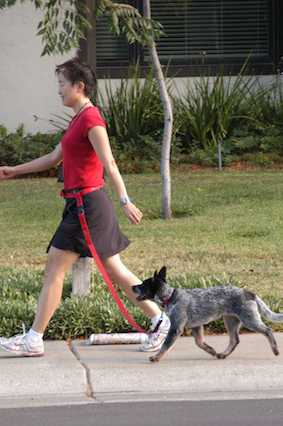 For these dogs, you’ll want to make sure they look at you all the time until they’ve developed a habit of heeling. Then you’ll increase the interval between treats and, as you do, they will relax more and eventually be able to stay next to your side even when they aren’t looking at you. By day 3 of training (i.e. by the 5th walk), Lucy was able to go on mile-long walks and I only needed to stop and reward her for sitting every half to a full block. She was required to sit and remain seated at all corners during that early stage of training. In fact, I even practiced rewarding her for remaining seated when I looked at traffic. It’s important to make sure you reward your dog for focusing on you even after you’ve been looking away. Some dogs learn to only focus on you when you’re looking at them. Here, Lucy’s learning that she’ll get rewarded even if I don't appear to be paying attention to her. In order to spice up the walk and improve the likelihood Lucy would want to stick by my side, I randomly threw in U-turns, about-turns and changes of speed. I also threw in repeat sits at a sprint pace. 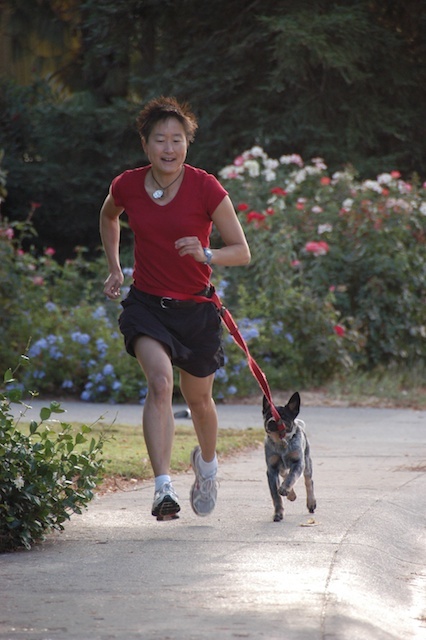 This gives Lucy a chance to sprint and then sit quickly. You can also use toys and tug as a reward on walks. I used a squeaky toy as a reward for Lucy. I’m using the game of tug here to keep Lucy happy when this gigantic lawn mower is nearby. It works. She’s not scared of the lawnmower because she’s busy having fun. 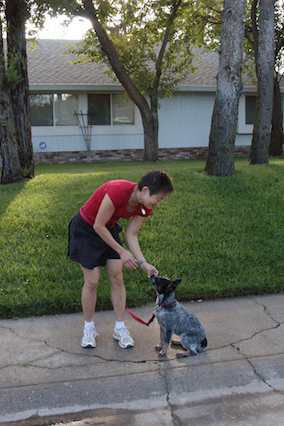 On day 4, I also start practicing other exercises, such as leave-it, during the walk. Here she’s learning that if she wants to chase after a dropped toy, she must first ask me for permission by sitting and looking at me. After I give her the verbal release word, I let her get to the toy on a loose leash. Then we play tug for about 10 seconds, I ask her to release the toy, and then we continue on our walk. This method is for dogs who walk by your side well but are too nervous to take treats or to look at you. Some dogs are at the point where they can walk by your side if you’re walking fast enough and in a straight line, but are too nervous to take treats on the walk or to look at you. For these dogs, just start with fast but controlled walking. The controlled exercise can help to calm them and by throwing in about- turns and U-turns, you help to give them something to focus on and keep their mind off the scary environment. If they’ll do repeat sits going backwards or on your side automatically without needing a food reward or if they respond positively to petting as a reward, then throw those exercises in too. 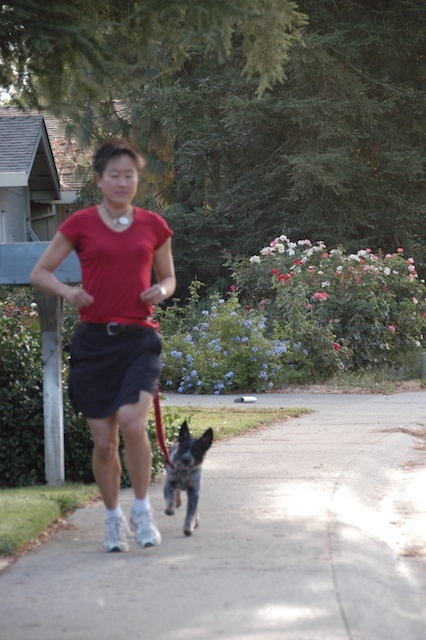 If they are distracted by something behind you, then jog for a few steps so that you can get them to trot after you instead of looking at the distraction that might be scaring them. Once these dogs start feeling a little relaxed, they tend to start taking food rewards and focusing on you more. Regardless of the technique you start with here is a summary of the major points. Practice in a low distraction environment first. 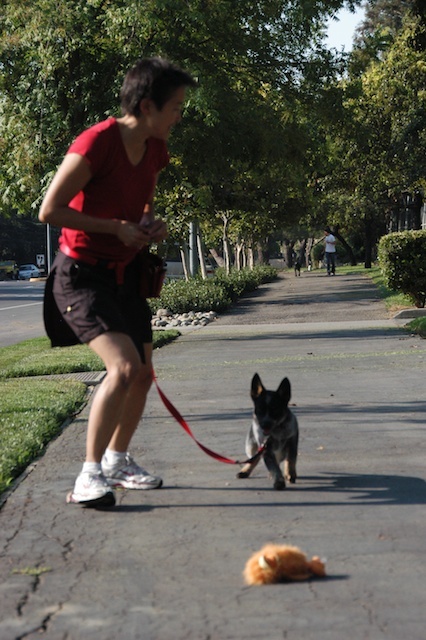 Start the heeling exercises right when you put the leash on Fido. He should never get a chance to pull. 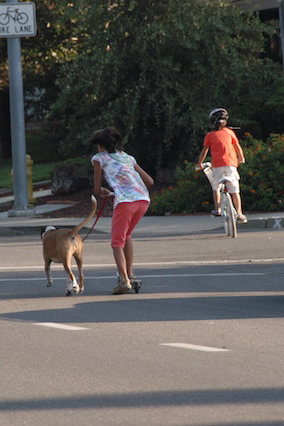 If Fido’s front paws get ahead of your feet, stop and wait for him to come back and sit in front of you. Then you can bring him back to heel position or just walk forward. 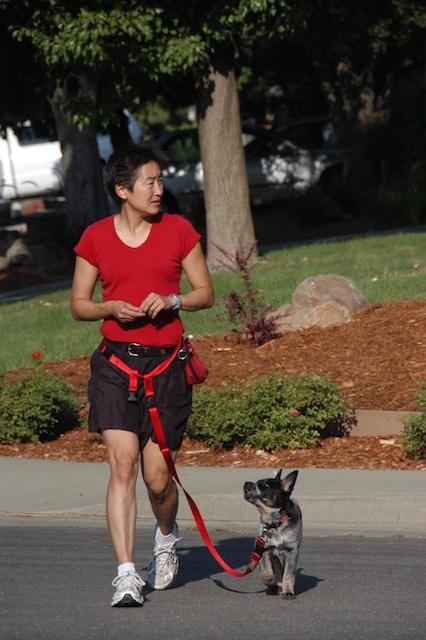 Note that if the leash is ever tight and you allow yourself to be pulled, then it will take way longer to make walking on loose leash a habit. 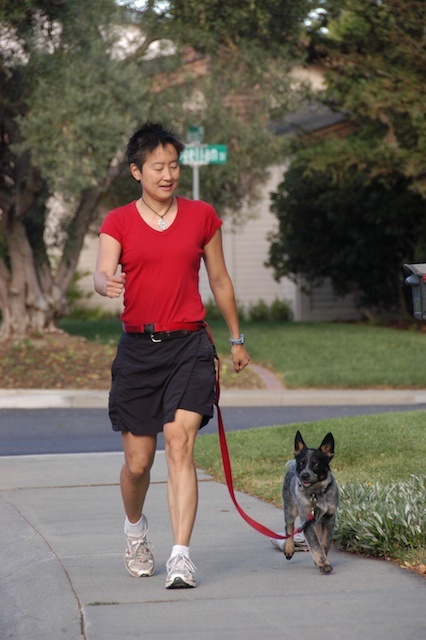 Start with frequent rewards for heeling or frequent repeat sits. 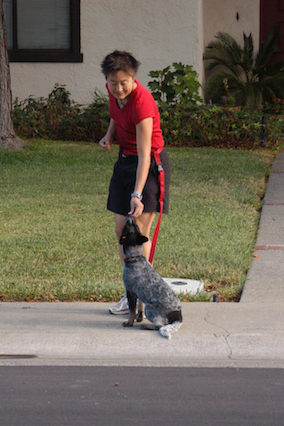 But as soon as the dog is consistent at one reinforcement rate, increase the expectation. For instance, require she heel and look at you for more steps before you reward her or only reward for repeat sits on average every 3-5 times. 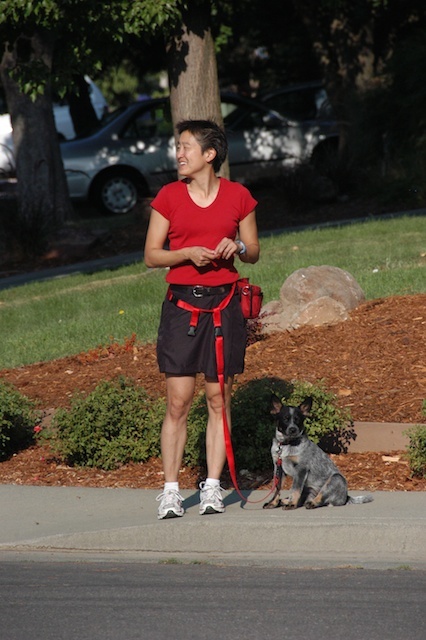 Keep the walks short enough so that you can keep Fido near your side during the entire walk. Go ahead and try the progression and see which starting method works best for you.